Arby's sets the pace for employee development in the restaurant world. And the restaurant press is buzzing about it. 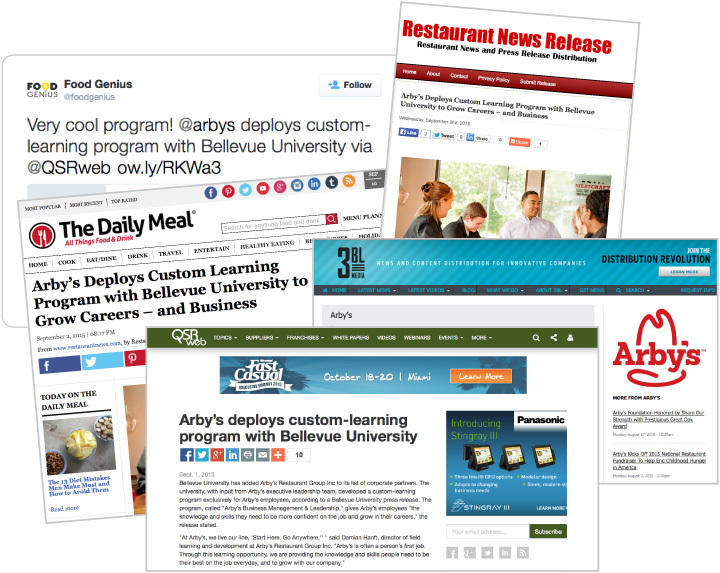 When word got out about the new custom learning program that Arby's Restaurant Group created, in partnership with Bellevue University, the food service press took notice. The story was picked up by every major food service/restaurant publication and website, including Nation's Restaurant News, QSR Web, The Daily Meal, Food Genius and many others. "I think the industry excitement is a response to our innovative approach," commented Damian Hanft, director of field learning and development for Arby's Restaurant Group, Inc. "We live our slogan, 'Start Here. Go Anywhere.' That led us to develop custom learning that gives our people the knowledge and skills they need to be confident on their job everyday — and to grow with our company." "It's really gratifying for our company to see this response," Hanft continued. "Working with Bellevue University, we are assured this program is affordable, Accessible — and, most of all, relevant to our people."